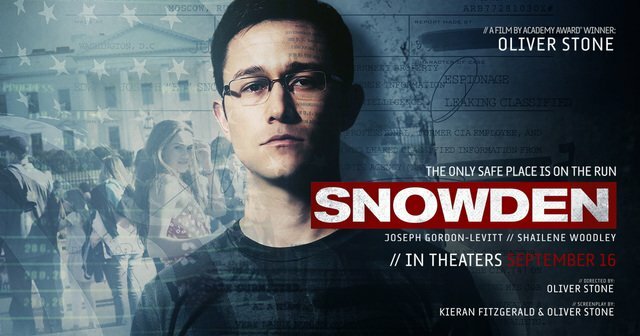 ‘Snowden’ Movie Trailer: Can Oliver Stone Make Whistleblowing Suspenseful? Of course he can. Have a look at the latest trailer for the upcoming Oliver Stone movie, SNOWDEN, due out in September. The Edward Snowden story is many things, but at some level, well apart from politics, it is a helluva thriller. Think of it: a young programmer, at great personal risk, figures out a way to gain access to a vast trove of very highly classified documents from one of America’s most secret agencies. He then discovers a way to beat all of NSA’s security to smuggle that information out of secure facilities. With the Feds no doubt on his heals, he finds his way to a foreign country, meets up with journalists, and reveals to Americans (and the world) that their own government has been illegally spying on them — reading their emails, listening to their calls, looking in their very bedrooms via hijacked webcams — for years. He then successfully eludes the full resources of the U.S. government and settles into a new life in Russia. So if that isn’t suspenseful, then not much can be. And it is hard to imagine a filmmaker more equipped to handle this story than Oliver Stone. Stone’s work has been all about creating narratives, often narratives contradictory to the mainstream, around significant historical and social events (Wall Street, W. Platoon, JFK). Snowden’s story may have found its natural storyteller. The trailer looks good, and shows a movie that is structured as a thriller, but one with a larger message. This film looks to be an excellent addition to the conversations about the changes he brought to the United States, and the world.